Dave from SolidFire was impressive. He had a quiet confidence that comes from knowing exactly what he’s doing. He knows his own product very well, which he should, but he also knows a lot about competitor products, and the market in generally. He was able to talk about all of them with the cool detachment that comes from focussed competence. Go watch the videos. This is what really smart, competent people look like when they’re talking about their area of expertise. He’s the CEO, so you expect him to be a decent salesman for his product. He has to convince customers to buy his stuff, but he also has to convince employees to work for him, and investors to invest in him and the company. CEO is a sales job first and foremost. But Dave also knows the technology very, very well. But let’s talk about the product. My favourite thing about SolidFire is the ability to pull out a node and re-install it somewhere else, on the fly. Other shared-nothing type deployments should be able to do the same thing, so it’s probably not unique, but this is the first time I’d heard it pointed out explicitly as a feature. In your traditional 2-site datacentre design, you’ll have a production site and a DR site. DR is probably smaller than prod, because you don’t plan to bring everything up if you lose all of prod, just the most critical stuff. You buy a big SAN for prod, and a slightly smaller one for DR, unless everything on the prod SAN is critical, which is often is. So now you buy two prod-sized things for your sites. Except your capacity forecasts, if you have any, are always wrong. In six months, you need more capacity in prod, and have spare in DR. Or the other way around, because someone decided to run dev out of DR because otherwise you’re ‘wasting’ DR capacity. The budget cycle is 12 months long, and you’re constantly being asked to reduce it anyway, but the business changes strategic direction with the season. If you can move a single node around, as you can with SolidFire, you can move hardware around to match actual capacity requirements, rather than what you guessed they might be six months ago. You can more closely match supply with measured demand, at the location of that demand, which is more efficient. If you get your forecasts wrong, or you simply change your mind, you can just move kit around to suit. You don’t have to go buy a bunch of extra kit simply because you put your existing kit in what turned out to be the wrong place. Features like this allow IT to deal with the world as it is, not as we might wish it was. The business needs to respond quickly to a changing market, and needs IT to help them. If that means waiting 4 months to order and provision a SAN upgrade, that’s too long. Rebalancing existing capacity is the same thing as moving VMs around inside a cluster, or moving staff into different roles, or adjusting manufacturing to match customer orders. Which is the holy-grail of IT infrastructure: to turn infrastructure resources into a fungible commodity, so you can buy a global pool of ‘some CPU’ and ‘some storage’ and move it about to where it’s needed, on-demand. You can adjust the overall pool based on aggregate demand, dialling it up and down as required. But with that specific pool, you move portions of it around the network to match local spikes and troughs in demand. The better you are at it, the greater your efficiency. Dave was very clear in his presentation about the tradeoffs SolidFire have made when designing for their target market. His comparisons of SolidFire with competitors Pure Storage and EMX XtremIO were all about the different tradeoffs the different companies have made. 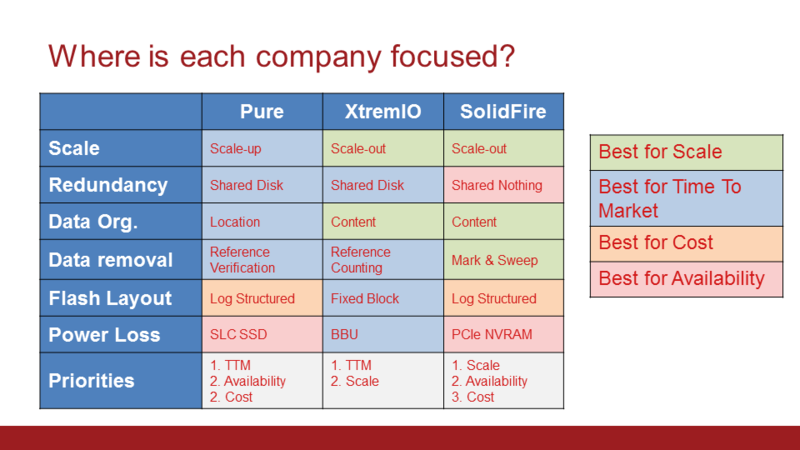 SolidFire focussed, in order, on scale, availability, and then cost. According to Dave, Pure focussed on time to market, then availability, then cost, and ExtremIO focussed on time to market and scale. These all make sense when you think about what kind of company is behind each of the different products. Dave educated all of us about the logic behind the choices SolidFire have made. He stepped through it in a non-jargony, clear way that made it easy to understand. He was also quite clear on the type of market SolidFire are going after: cloud service providers and similar enterprises who need lots of very fast disk in big pools. Pure is best suited to specific pools of fast, available disk (like for databases). ExtremIO is somewhere in between, predictably fast storage for several workloads, topping out at 40-80TB per pool. What makes a good choice for you depends a lot on your individual requirements, so making any kind of broad statement about one or the other being ‘better’ overall is stupid and unhelpful. Various people will persist in making that kind of bogus claim, but hey, humans gotta human. 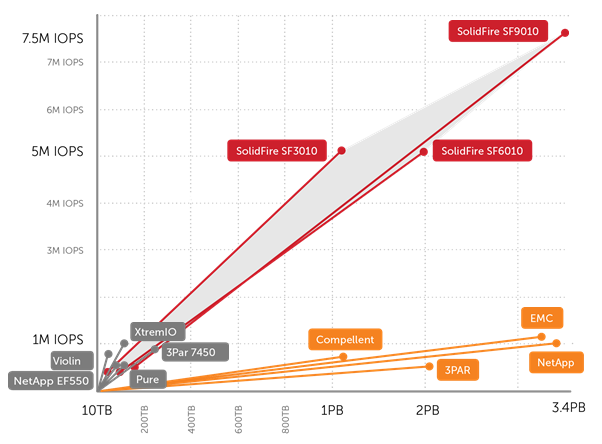 SolidFire looks like a really solid (sorry) product. I expect more good things from them in future, and they should prove a strong contender in the explosion of flash storage startups currently enveloping us. Tagged emc, extremio, flash, purestorage, sfd5, solidfire, ssd.